Christopher Froome took another step closer to a commanding win in the 100th edition of Le Tour with a dominating 33 km Individual Time Trial to Mont St Michel today. Only the current World Champion Time Trialist, German Tony Martin, was able to beat Froome today and the gap to the other podium contenders has widened. Valverde wouldn't normally be considered a GC contender, however he is closest to Froome at almost 31/2 minutes down. Contador is almost 4 minutes behind and Cadel Evans at an almost 7 minute deficit can kiss goodnight to a podium this year. Tomorrow will be a sprint into Tours and we will be there to watch the action after an 80 km roll through the beautiful Loire Valley. We're currently staying in the beautiful town of Blois, right on the banks of the Loire. 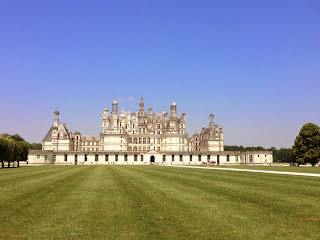 We arrived in the Loire Valley after a bus trip this morning from Paris and started our day with a visit to Chateau du Chambord. The Chateau was built in the mid 16th Century, housing 440 rooms, 365 fireplaces, 13 great staircases and stables for 1200 horses. 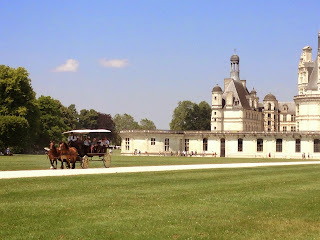 With the threat of the German invasion during WW2, the art collections of the Louvre and Compiegne museums were housed here. After our visit we headed off on our ride for the day, a brisk 70 km trip back to Blois in time to see the closing half hour of the Time Trial at our hotel in Blois. 1. A 75 km loop from Vence to Nice, along the waterfront and then up to Eze, followed by the climb to Col Madone and then down to the beautiful Italian border town of Menton. The Madone was made famous by a certain Texan, who used this climb as a test of his form prior to each of his Tour campaigns. Here is a pic on the top of the Madone. 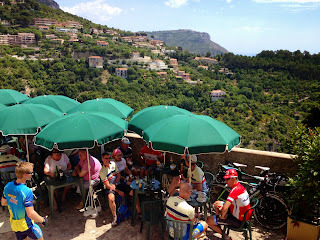 A couple of pics of Eze are below, its a small walled village high above Monaco. Gathered you were going to write something at end Pete? Just love it all, so wonderful to see, and loved the ITT last night in Normandy, did post today of my pickies of Normandy and Brittany. The Loire valley surely is picturesque so tight will be good..
Will be interesting to see if Les Alpes and next ITT which has two decent climbs (think it was) will change the GC. still not nec. signed, sealed and delivered for Froome but looking that way, I guess..